Meet Brownie! 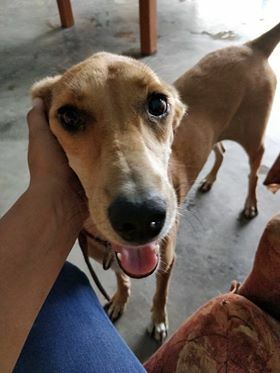 Brownie is about 2-3 years old and a desi/Indie dog. Her entire human family died in a car accident on June 18, 2018 while returning from a pilgrimage trip in India. This is the link to the news published in newspapers about accident of her entire family. https://m.hindustantimes.com/punjab/four-of-delhi-family-among-7-killed-as-car-rams-into-parked-truck-in-amritsar/story-PS1mycoTelMtIEvQ1NhXRN_amp.html Our rescue partner in India took her into her care when a neighbor of the family posted her on FB asking for help as she became a street dog and wasn't adapting well to living on the streets. She loves people and is always asking for cuddles and pets. It's clear she was once loved and yearns for that again. Brownie is being fostered in Bend, Oregon. Will you be her hero?